On Tuesday, April 24 the Cosby Sweater Mondays had their first Cosby Sweater Fashion Show. The actual fashion show began with five different people wearing their sweaters down the catwalk. After every person went down the walkway, the sweaters were individually auctioned off. 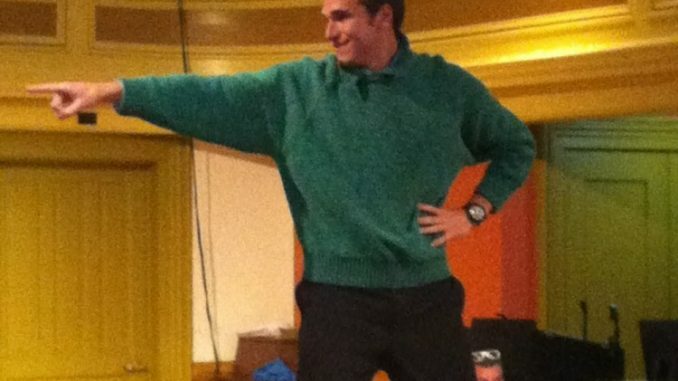 The bids for the each sweater began at three dollars and ended up as high as $13. The combined sale of all five sweaters ended up raising $37. After the first sale, Lewis’s little sister, Talytha, went on stage to sit with Bradley Baker, Ann Arbor sophomore, to perform his own version of “Kids Say the Darnest Things. He asked six-year-old Talytha questions about her day and where she would want to be. She wanted to sleep. The second round was organized the same, except bids started off at two dollars. The combined sale of these four was $30, even though one didn’t sell. After the second round, the women of acapella group Bella Voice performed for the crowd. The songs performed were “The One That Got Away,” “Madworld” and “I Will Survive.” Lewis beat boxed. Following the performance was the third and final round of auctioning, which began at one dollar. The combined sale of the third auction was $23. Afterwards, everyone who purchased a sweater walked down the runaway adorning their new additions to their wardrobe. The money raised for the event will be a saved for next year. Josh Van Laan is currently a sociology major from Clinton Township.